I finally mailed off the package of beanies. Hopefully the crochet version will get an OK and I’l share it. But in the meantime, I had a couple of emails from people asking about the Magic Loop version of two-at-a-time. As I had annotated the original pattern for myself, I figured I might as well write it up. I like making one girly one and one boyish one when I do two at a time. And while I did manage three at a time, the problem is with keeping the yarn straight. The middle ball needs care and attention, much more than just two do. I wanted to try adding an active link to my PDF – I had to use a different program than I usually do so it was learning something new. It worked, but when I view it the links don’t look active, until you hover over them. THEN you can see the cursor that indicates a clickable link and clicking will open the page in your browser. I wanted to add links to videos or instructions that I found useful. I have ones for the Limitless Cast On for 2-at-a-time ANYTHING, a general 2-at-a-time sock video, invisible joining to knit in the round (and I also find this trick helps me not let the stitches twist when joining) and as the beanies need to stretch and not be too tight, a couple of stretchy cast on videos. Here is a PDF. Any feedback would be very welcome! 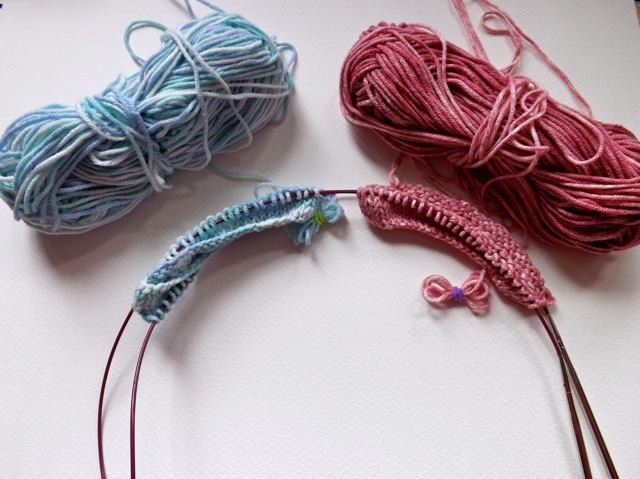 Categories: knitting | Tags: how-to, knitting | Permalink.